A 15-year-old autistic athlete running a 5K was assaulted by a man who apparently thought the teen was going to rob his wife, the Washington Post reports. Chase Coleman loved being part of his cross-country team, and his mother, Clarice, said that she fully supported his passion. She is thankful that the nearly nonverbal, autistic teen had found "his sport," according to the report. 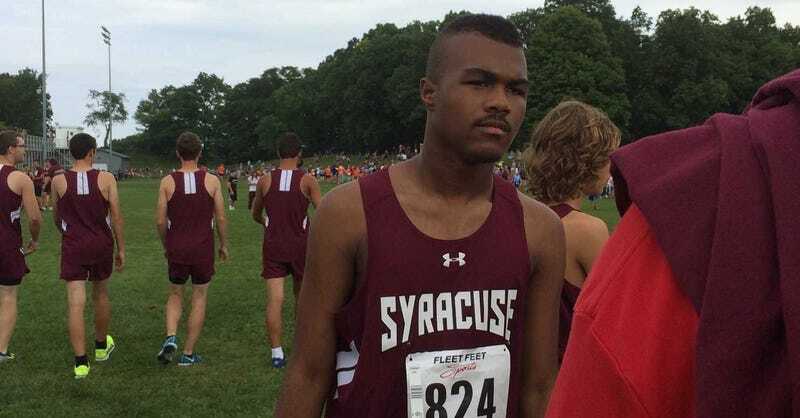 However, a few weeks ago, the mother's worst fears came true when Chase was assaulted in the middle of a race in Rochester, N.Y., while running with his team from Corcoran High School. According to the Post, Coleman was waiting for her son to appear at one part of the race course, but he never did. So, as she was used to doing, she went looking for him. Coleman said she ran to get to her son, whom she saw walking toward her with a bicyclist who was assisting him. Chase put a hand on his back and simply said, "Back," according to the report. A witness, identified as Collin Thompson, told police that she saw Chase running in the middle of the road. She said that an older white man got out of the car and approached Chase and pushed him to the ground, yelling, "Get out of here," the Post reports. Both witnesses got the man's license plate number, and police were able to track down 57-year-old Martin MacDonald, who lives in a suburb of Rochester. MacDonald admitted pushing Chase to the ground, according to a police report. Clarice Coleman said the police told her of MacDonald's explanation, adding that it had been black youths who had allegedly broken into his car. Coleman said she is furious that this was used to justify an attack on her son. “I said, impossible. That’s a lie. Chase don’t even know how to defend himself. What? He can barely ride a bike,” Coleman said. “[Chase] was in a uniform. He had a number pinned to him. How did you think that he was out trolling to steal your car? … You can’t tell me that it wasn’t because my son wasn’t black. There were Asian kids, there were Caucasian kids. But you picked the black kid to say, ‘That crossed my mind’? However, Rochester City Court Judge Caroline Morrison later sent a letter to the Colemans on Oct. 21, denying their warrant application, saying that MacDonald would not be charged with second-degree harassment. Coleman said that a week after he was attacked, her son refused to go to his team practices and skipped running in his last meet of the season. Coleman said that she also watched her son turn in his uniform to his coach, who encouraged him to change his mind, but Chase refused. Coleman told the Post about the joy that her son had found in running after several attempts at other sports like soccer, baseball and basketball. Chase, she said, had developed his own little family with his team, with all of them, boys and girls, showing up to his "bro mitzvah" when he turned 13. Read more at the Washington Post and Syracuse.com.